Scientists have developed an octopus-like robot, which can zoom through water with ultra-fast propulsion and acceleration never before seen in man-made underwater vehicles. Most fast aquatic animals are sleek and slender to help them move easily through the water, but cephalopods, such as the octopus, are capable of high-speed escapes by filling their body with water and then quickly expelling it to dart away. Inspired by this, scientists from the University of Southampton, Massachusetts Institute of Technology (MIT) and the Singapore-MIT Alliance for Research and Technology built a deformable octopus-like robot with a 3-D printed skeleton with no moving parts and no energy storage device other than a thin elastic outer hull. 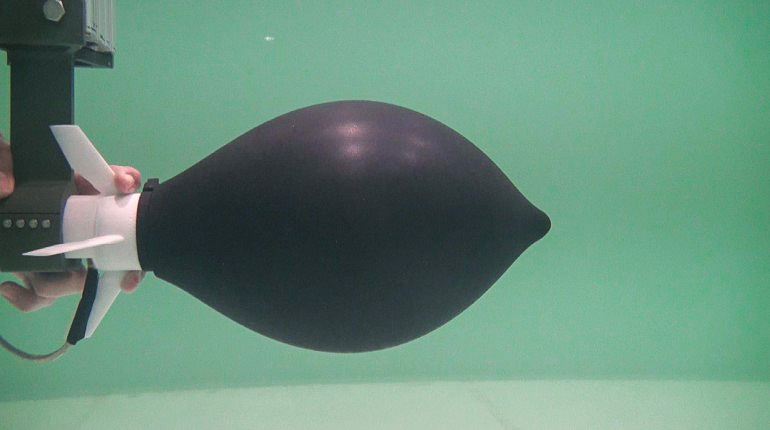 The 30cm-long self-propelling robot is inflated with water and then rapidly deflates by shooting the water out through its base to power its outstanding propulsion and acceleration, despite starting from a non-streamlined shape. As the rocket contracts, it can achieve more than 2.6 times the thrust of a rigid rocket doing the same maneuver. It works like blowing up a balloon and then releasing it to fly around the room. However, the 3-D printed polycarbonate skeleton inside keeps the balloon tight and the final shape streamlined, while fins on the back keep it going straight.